India is a beautiful country of multiple religions, languages and cultures. With religion and communal norms having an important part in India, Indian weddings are much more than just a legal union of two people; they are a combination of love, tradition, celebration and revelry. Though Indian weddings are varied across the subcontinent, the common thing in everything is the essence of commitment. Indian weddings are better understood based on the regions where they are preformed like North Indian weddings, East Indian weddings, South Indian weddings and West Indian weddings. These weddings have their individual style of grandeur and magnificence that has increased in popularity across India. The main ritual is performed in the bride’s home, along with various pre-wedding ceremonies like Sagai or engagement ceremony and post-wedding ceremonies. On the wedding day, the bride’s father treats the groom with honey and yoghurt and welcomes him to the household. The exchange of garlands, called the Jaimala ceremony is important in north Indian weddings as it signifies the acceptance of one another. 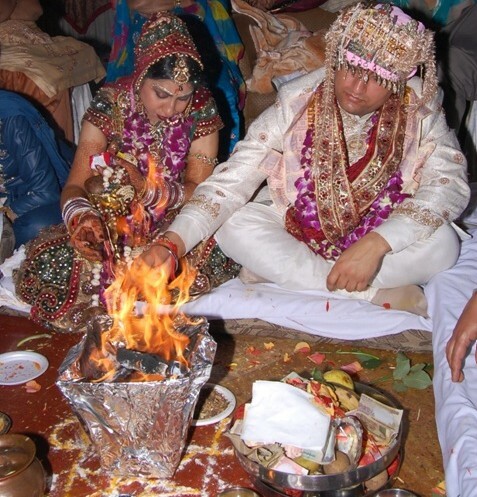 The havan or ceremonial fire is lit as a holy witness to the wedding and the couple offers sacrifice or rajaham to the fire. The ritual to follow is the Gath Bandhan, which symbolizes eternal ties and next ritual is the Saat Phere or Mangal Phere, the most important of north Indian wedding traditions. This is when the bride and groom circle the fire holding hands while taking vows to be besides each other throughout their lives. The couple is then blessed by elders of the family. Tying the mangalsutra and applying vermilion on the bride’s head by the groom is also symbolic in north Indian weddings. The special feature of south Indian weddings is the importance it places on flowers and fragrances. You find the gates of any south Indian wedding hall decorated with full-grown plantain trees and mango leaves festoons, which signifies the couple will enjoy a strong, loving and evergreen relationship. It is the nadaswaram notes which are recited loud and clear that signify that the wedding is a sacred and divine relationship. You will find kolam, or rangoli designs at the doorsteps of the wedding venue to indicate the colorful and happy mood of the wedding. Guests are heartily welcomed to the wedding in south Indian marriages by sprinkling rose water on them, and thus perfume them. Flowers are offered to the female guests, as a sign of sowbhayam for them. Sugar candies that are distributed here all indicate the sweetness of the occasion. East Indian weddings are performed strictly following Vedic rules and regulations. The important rituals and traditions of east Indian marriages are best displayed in the states of West Bengal, Assam, Orissa and Bihar. Assamese weddings are simple and marked with the melody of their wedding song, ‘biya naam’. Besides various pre-wedding rituals the main wedding rituals here include the ceremonial bath, the wedding reception, the arrival of the groom and the wedding. The Bengali wedding is rather interesting with lots of merrymaking. The traditional Bengali marriage rituals are divided into pre marriage rituals like Dodhi Mangal ceremony and wedding piris, wedding rituals like welcoming of the bride and Saat Paak ritual and post marriage rituals like Basar Ghar and Bou Baran. The application of vermilion powder in the parting of bride’s hair signifies the culmination of the east Indian wedding after which the couple seeks the elder’s blessings. The bride is then sent to her new family following some customs like a name change. She is ceremoniously welcomed into the new house and has to enter with her right foot first, while kicking over a mound of paddy. All these rituals show that east Indian marriages are amalgamations of tradition, fun and prosperity. The specialty of west Indian weddings is that they all collectively reflect the different cultures of Indian states like Gujarat, Rajasthan and Maharashtra. Although west Indian cultures are a bit different from the cultures of the rest of the nation, their rituals are quite similar. In fact, west Indian marriages follow western Indian customs. This is why the weddings in the states of Rajasthan, Maharashtra, Gujarat and other states reflect their customs and traditions. The arrangement of any Indian wedding is considered the liability of the both the bride’s and groom’s parents and other relatives. In western India, there is no bigger event in a family than a wedding. You can thus find complex combinations of the Indian social systems best displayed while arranging and executing West Indian weddings. Muslim weddings are known as Nikaah, and can take place at a convenient time and the venue can be the bride’s or groom’s house. In orthodox Muslims, men and women are made to sit separately. Once the Maulvi reads various verses from the Quran, the Nikaah is considered complete once the proposal and acceptance of the wedding is completed. It is very important that there is mutual consent of both the bride and groom to the wedding to consider the marriage to be legal. Moreover, Muslim marriage laws rule that neither of the parents can be legally incapacitated from performing the marriage. The couple is considered husband and wife once they sign their official paperwork in an Imam’s presence. Christian weddings are considered to be a union of man and woman, predestined by God. The husband and wife are considered one in a Christian wedding, which is conducted in a church amongst friends and family members. The Christian wedding comprises of an engagement, the actual wedding and a reception. The engagement ceremony is followed by a hen party called a bridal shower where the bride’s friends gather and enjoy themselves singing and dancing. Similarly, the groom holds a bachelor’s party with his friends. The wedding is solemnized by the priest in the church. He reads psalms from the Holy Bible and then asks questions relating to the consent of the bride and groom to the marriage. When the bride and groom promise to stay with each other through thick and thin they exchange rings which are blessed by the priest to instill love and faith in the couple. The wedding concludes on signing the register, and the couple’s walking down the aisle, arm in arm. This is an amazing post and thanks for giving the information about Types of Indian weddings, as i am a Indian so i really glad to know about all these things, Thank you.